This review first appeared in the January issue of Apollo. 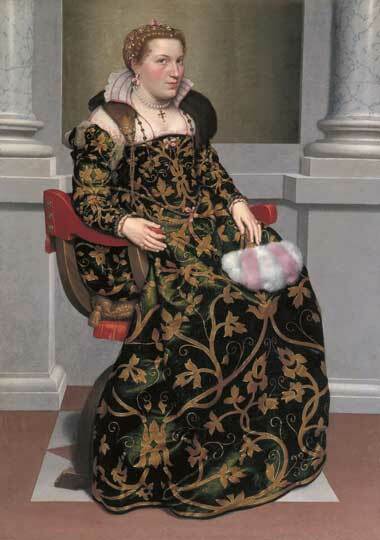 Giovanni Battista Moroni’s (c. 1520/24–1579/80) portraits of northern Italian gentry are well represented in British museums, but the Royal Academy’s small, elegant exhibition shows them in a new light. A British affection for this rather isolated artist from mid 16th-century Bergamo began in the 17th century. His combination of informal poses and elaborate costume was admired by Van Dyck, and a few of his works were brought to England in the reign of Charles I. In the early 20th century, Bernard Berenson paved the way for a mini-revival of interest in Moroni by likening the painter’s sober grey and black full-length portraits to the society portraits of Manet or Whistler. At that time a number of his works were sold from Italian collections to American and British museums, including the National Gallery. The comparison to 19th-century portraiture is interesting, for Moroni seems deliberately to elicit some kind of anachronistic response from his viewers. But, ultimately, to compare his works with those of Manet and Whistler probably does not do Moroni justice. This exhibition points the way towards a richer understanding of his work in a 16th-century context. The show opens with some of his religious images, a part of Moroni’s oeuvre that is less well known. 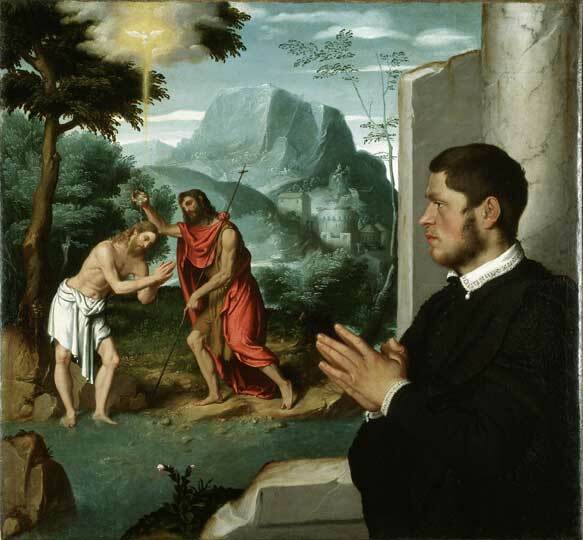 Devotional paintings, such as A Gentleman in Adoration before the Baptism of Christ (c. 1555–60), are paired with altarpieces by his teacher Moretto da Brescia (c. 1492/95–1554). Moretto worked dal naturale, from posed models, and his painterly blending of figures and atmosphere strongly recalls Venetian art of the same period. His pupil Moroni’s altarpiece of The Trinity (c. 1552–53) placed next to Lorenzo Lotto’s altarpiece of the same subject (c. 1519–21) makes a thought-provoking comparison. It demonstrates Moroni’s reinvention of his predecessors’ achievements, particularly when it came to painting otherworldly or visionary subjects. 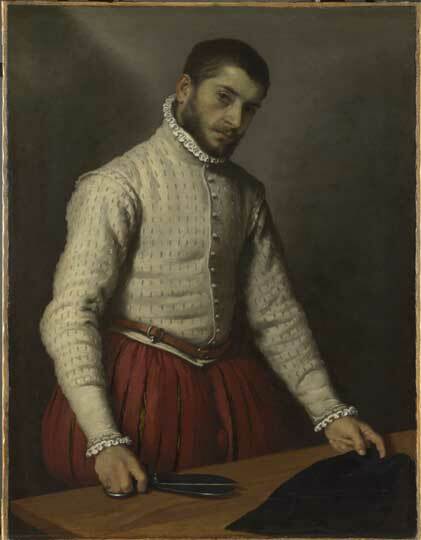 Moroni moved towards a more deliberately varied approach than either Moretto or Lotto. In a single field, he juxtaposed the detailed and tightly-painted likeness of the praying patron with a religious scene using a broader technique and lighter palette. The picture evokes the effects of silent prayer by making the sacred story seem dreamlike, as if seen through the inner eye of the devout viewer. The contemporary parallel to Moroni’s creation of a split image of prayer is Ignatius Loyola’s Spiritual Exercises (1522–24), which the catalogue reminds us was very much part of the visual culture of Spanish-ruled Lombardy. A print by Albrecht Dürer provided the composition for the religious side of Moroni’s painting, identifying the realm of visionary experience with the role of art. If the first rooms of the show develop the idea of Moroni’s distinctive response to his immediate forebears in religious art, the rest of the exhibition explores his portraiture. We first encounter Moroni’s practice of painting from life: he is known to have worked from the posed sitter without preliminary drawing. Seen in the light of Moretto da Brescia’s altarpieces, Moroni’s portraits made from life remind us of the continuity of Lombard practice that Caravaggio inherited in the following generation and put to such spectacular use in Rome. Here the effects of working from life are rather subtle, the spontaneity of touch and of perception less visible than in Moretto’s work. The exhibition segregates Moroni’s portraits made dal naturale into a separate category, begging the question of whether this practice was reserved only for a certain type of sitter. The catalogue reminds us of Titian’s remark that middling dignitaries should go to Moroni to have their portraits done from life. Popes, emperors and doges presumably expected something more formal, more idealised from Titian himself. Yet Moroni’s own aristocratic portraits could hardly be more formal. He created a formula for the full-length portrait, combining the richest depiction of costume with the extreme sobriety of crumbling grey stone as a backdrop. Time passes and takes its toll on the worldly surroundings of these figures, but they are themselves extracted out of time. Sitters’ expressions are concentrated on some inward awareness even as their glances, over the shoulder or to one side, address the viewer in seeming intimacy. In his portraits of women and girls, this powerful sense of inward awareness in his figures is all the more striking. If at first they seem in thrall to their stiff costumes, on further examination their expression of individual consciousness seems remarkably modern. More than one modern commentator has said that Moroni’s sitters look like people we know – again an anachronism, which is perhaps the artist’s intention. Moroni evokes a sense of both temporality and timelessness through a subtle contradiction between the sitters’ very individual appearances and seemingly abstract settings. His work shares these traits of combined abstraction and naturalism with some of his contemporaries in the third quarter of the 16th century, as Federico Zeri pointed out in his 1957 study, Pittura e Controriforma: L’arte senza tempo di Scipione da Gaeta. Zeri proposed that the generation of artists to which Moroni belonged gave purest expression to the spirit of the Counter-Reformation. Theirs was an ‘art without time’, of a naturalism heightened to the point of extraordinary fixity and clarity of form, as though transcending any contingent circumstances. Moroni’s late portraits make the secular aristocracy of 16th-century Lombardy seem like sacred figures. The divided world of his early devotional pictures is united in these works. The catalogue accompanying the exhibition sheds light on the reception of Moroni. When his portraits left their original Italian collections, and also when they passed out of English hands in the mid 17th century, information about the sitters was lost. This is usually the reason portraits disappear, but Moroni’s paintings gained new life as collectors’ pieces – elegant in themselves and not in need of their sitter’s original prestige. The history of Moroni’s reception is a story of forgetting. An exhibition at the Kimbell Art Museum in 2000 did much to reverse that trend; only 10 of Moroni’s paintings were on display there, but they were the platform for a series of scholarly essays on the artist’s historical context. The present exhibition, like its predecessor, returns to us some of what has been lost.